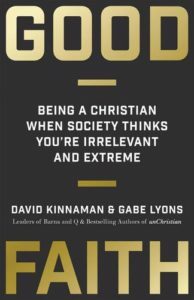 In this episode of the 5 Leadership Questions Podcast Todd Adkins and Barnabas Piper are joined by David Kinnaman, owner and president of the Barna Group and co-author of several books (with previous guest, Gabe Lyons) including the most recent, Good Faith: Being a Christian when Society Thinks You’re Irrelevant and Extreme. The conversation covers everything from verified statistics to parenting to Christians in culture. Enjoy!